Game is incredibly mod-friendly and includes Steam Workshop integration. See Mods. Includes a CD-key and a launcher for patching. All versions require a Runic Account for online play. Runic Games keys can be redeemed on Steam if purchased prior to February 2, 2015. Syncs up to 953.67 MB of save data (maximum 250 files). 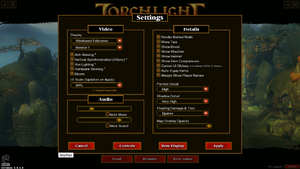 Torchlight II video settings menu. No built-in support; Runic supplies an officially-recommended Steam Controller configuration for the Steam release of the game. Additionally, there is an XInput Mapper made just for this game. See here for details. If you have your primary and secondary mouse buttons swapped in Windows' Mouse settings, the game does not honor this. You can still swap your LMB/RMB actions in the game's options but things like dragging items in your inventory will still be backwards. The GOG.com version includes non-English language support. Online play requires a Runic Account. Torchlight II is designed to be extremely friendly and open to modders and has an extensive and strong modding community. Almost everything can be modded in; from translations, graphics and sound to maps and classes. Torchlight II comes with its own editor called GUTS. It allows map, items and story modding. Mods are usable in multiplayer, as long as everyone in the game has the same mods. It can be downloaded from Steam under Library in the tools section. A complete conversion mod for Torchlight II that is currently in active development. SynergyMOD adds new gear, monsters, quests, pets, dungeons and more. Also adds a whole new class called the Necromancer and two other classes that are still in alpha stage, the Warlock and Paladin. More information can be found on their website and Steam Workshop page. 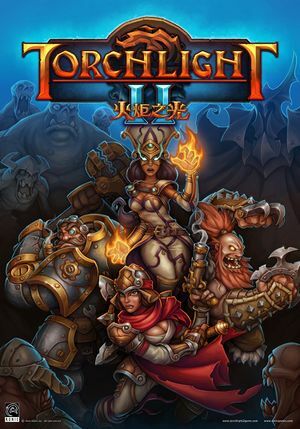 ↑ Torchlight II | Big News!